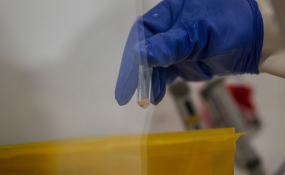 Health officials have said they will begin administering an experimental vaccine following a new Ebola outbreak last week. The drug was previously successful in containing an outbreak in the northwest of the country. Health officials from the Democratic Republic of Congo (DRC) said they will begin administering Ebola vaccinations in the eastern cities of Beni and Mangina, which experienced an outbreak of the disease last week. Officials say the experimental vaccine, produced by drug maker Merck, was successful in containing a similar outbreak less than two weeks ago in northwestern Congo. Beni's Ebola response director Barthe Ndjoloko Tambwe said the vaccinations would be given to health care providers, confirmed Ebola victims and those with whom they have been in contact. The country's Health Ministry says 30 probable cases have been detected in the Beni area. So far, 13 cases have been confirmed and three deaths registered. During the recent outbreak in the northwest, vaccinations were given to 3,300 people. Officials say this helped contain the outbreak. Congo has 3,000 doses of the vaccine in stock and health workers there have been busy setting up a so-called cold chain to keep them well below freezing, a major challenge in Congo's tropical climate. Lack of reliable power supplies adds to the difficulty facing health workers to that end.